The United States teams will both play Thursday for a place in the semifinals of the Junior Davis Cup and Junior Fed Cup competition, but how each team stayed undefeated couldn't be more different. The girls, seeded second, have yet to lose a set, with Claire Liu and Kayla Day winning both their singles matches and then partnering to win the doubles for a 3-0 victory over New Zealand. They will play No. 6 seed Spain in the third and final tie in their round robin group, with Spain also winning both their previous ties 3-0. In two of the four Junior Fed Cup round robin groups, undefeated and seeded teams will face each other: No. 1 Czech Republic v. No. 5 Australia and the USA vs Spain. The other two groups have been less predictable. No. 4 seed Canada needed a third set in doubles to get by No. 7 seed Great Britain, which has now lost both their ties and is eliminated from contention. Canada will play unseeded Japan, one of two unseeded teams with a chance to move into the semifinals. Italy defeated No. 8 seed Brazil today, leaving both countries with a 1-1 record. If Brazil defeats No. 3 Russia and Italy also wins over Taiwan, three teams would be 2-1 in that group, so percentages would decide the group winner. Russia is the clear favorite to advance, however. The US boys got a quick lift from Kalamazoo 16s champion Patrick Kypson, who was named to the team last week to replace Gianni Ross, who was ill and unable to travel. Kypson, playing No. 2 singles, defeated Gabriel Bugiga of Brazil 6-1, 6-1 giving the US a 1-0 lead, but Sam Riffice dropped the opening set of his match against Gabriel Decamps at No. 1 singles. Riffice was up 4-2 in the second set when he suffered an injury, which was reported as a torn hamstring by the ITF. He received treatment (the score was deuce in the game), lost the next two points and retired, with the score 6-1, 3-4. That meant the US had to win the doubles point, and without Riffice, who has played regularly with Vasil Kirkov for some time now. Kypson was called on again, and after dropping the first set, Kirkov and Kypson claimed a 4-6, 6-0, 6-2 victory over Enzo Kohn and Decamps. The final set was not quite as easy as the score might indicate, with Kirkov saving two break points serving at 2-4. But another break gave Kypson an opportunity to serve out the match, and after seeing two match points come and go, the Americans converted the third. Kypson and Kirkov will play No. 8 seed Japan to decide which country advances to the semifinals. All four of the matches so far in their round robin group have been decided by the doubles point, a rare occurrence. In the article linked to above, USA captain Sylvain Guichard says that Ross was going to be the No. 2 player, meaning the US now is relying on players originally 3 and 4 on the depth chart. The other three ties on Thursday will also be winner advances to the semifinals, with all seeds going 2-0. No. 1 Canada will play No. 7 Czech Republic, No. 2 Australia will face No. 5 Germany, and No. 4 Russia will meet No. 6 Argentina. Australia's No. 1, Alex De Minaur, who reached the US Open boys semifinals as a qualifier, has an interesting international background, as revealed in this feature by Sandy Harwitt. Live streaming is available, and I expect the US girls to be on a streamed court given that host Spain provides the opposition. Live scoring is available here. Only one of the 16 seeds in the Junior Davis Cup and Junior Fed Cup lost in Tuesday's opening day of play, but several of the favorites were tested, including the US boys. Seeded third and playing unseeded Spain, the US went down early to the hosts, with Vasil Kirkov losing to Andres Fernandez Canovas 6-0, 6-3. That meant Sam Riffice had to win at the No. 1 spot, which he did, meaning the doubles would decide the match. Up 6-3, 4-2, Kirkov and Riffice lost five straight games, but then won five straight and finished off the 6-3, 4-6, 6-2 win. The US boys will play unseeded Brazil on Wednesday, and according to the order of play, will be on one of the courts that is streamed at tennisjuniortv.com. Top seed Canada defeated Poland 3-0, but Felix Auger Aliassime, the highest ranked ITF junior in the field, had to come back from 6-4, 4-0 down against Poland's Kacper Zuk to win 4-6, 7-6(1), 6-4 and avoid having the doubles decide it. The seeded team that did lose was Junior Fed Cup seventh seed Great Britain, who fell to Japan 2-1. I'm not sure why Katie Swan didn't play doubles, after the British No. 1 won her singles match to send the tie into a deciding doubles, but she didn't, and Ayumi Miyamoto and Kimika Sakata defeated Jodie Anna Burrage and Ali Collins 6-4, 4-6, 6-2 to complete the upset. The No. 1 seeded Czech Republic team won both singles, but lost the doubles point to the Netherlands, while the USA team, seeded No. 2, breezed past Egypt 3-0. For more on the first day's action, see the ITA Junior website. Complete results are below, and live scoring can be found here. Four USTA Pro Circuit events are underway this week in the United States, with a women's $10,000 tournament in Charleston, South Carolina, a $50,000 women's tournament in Las Vegas, a men's $100,000 Challenger in Tiburon, California, and another $10,000 Californian Futures, this one in Laguna Niguel. Lauren Herring was the top seed in Charleston, but lost her first round match today 3-6, 6-4, 6-0 to LSU junior Joana Vale Costa. As is common for $10,000 level events, most of the qualifiers are juniors, with Americans Abigail Desiatnikov, Meibel Chi, Elizabeth Scotty, Stephanie Nemtsova among the eight who advanced to the main draw. 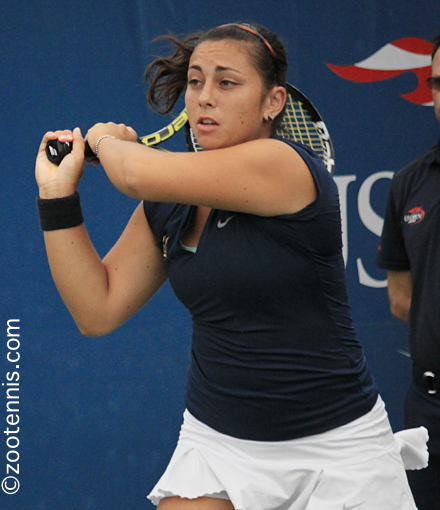 US Open girls semifinalist Francesca Di Lorenzo received direct entry and will play No. 2 seed Laetitia Sarrazin in the first round Wednesday. Qualifying was also completed today in Las Vegas, with Robin Anderson moving into the main draw after three qualifying wins for the second week in a row. Anderson, the No. 5 seed in qualifying, defeated No. 3 qualifying seed Sharon Fichman of Canada 6-2, 7-5 and will play No. 5 seed Alexa Glatch in the first round on Wednesday. As was the case last week in Albuquerque, An-Sophie Mestach of Belgium and Anna Tatishvili are the top seeds. At the $50,000 ITF Women's Circuit event in Mexico, Grace Min and Kristie Ahn have advanced to the second round. In Tiburon, the first round will be completed today, with 11 matches scheduled, after five were played on Monday. UCLA junior Mackenzie McDonald has continued his outstanding play this month, with the wild card collecting a 6-4, 6-4 win over Frederik Nielsen of Denmark. Frances Tiafoe and No. 7 seed Blaz Rola played an entertaining first round match with the 2013 NCAA champion taking it 6-7(0), 7-6(6), 6-3. Top seed Denis Kudla, No. 3 seed Tim Smyczek, Ryan Harrison(5), Bjorn Fratangelo(6), Jared Donaldson(8), Alex Kuznetsov, Mitchell Krueger and qualifier Dennis Nevolo are Americans who have reached the second round. Dennis Novikov, coming off two straight Challenger titles, lost to former Wisconsin star Marek Michalicka of the Czech Republic 6-4, 6-3, avoiding a third straight meeting with Ryan Harrison, this one in the second round, that everyone had anticipated. The USTA's third TeamUSA forum of the year is scheduled for tomorrow--Wednesday, September 30--at 8 p.m. Eastern, with the Player Pathway, resources and drills and a Q and A with Player Development general manager Martin Blackman on the agenda. Register now at this page. There is no charge for the webinar. The draws for the 16-and-under Junior Davis Cup and Junior Fed Cup competitions in Madrid were revealed today, with the United States' girls team given the No. 2 seed and the United States' boys team seeded No. 3. This means both are seeded No. 1 in their round robin groups. 5-8: Australia, Spain, Great Britain and Brazil. The United States was forced to change its team when Gianni Ross, its No. 3, could not make the trip due to illness, with Patrick Kypson replacing him. The US is not the only team with a late change, with four others substituting from the original nominations early this month. Canada has lost its No. 2 Katherine Sebov, with Vanessa Wong replacing her. The other three changes are in Junior Davis Cup. The Czech Republic lost its No. 2, Tomos Jirousek, Germany lost its No. 2, Rudolf Molleker, and Poland's No. 3, Michal Sikorski is out. The complete roster of all 32 teams is available at the ITF tournament page. Live streaming will be available via tennisjuniortv, but only for courts 2 & 3, which on Tuesday feature top seeds the Czech Republic and Canada. In addition to the three titles US juniors claimed at the Grade 2 last week in Montreal, the Grade 5 in Puerto Rico also proved rewarding for four US juniors. Sixteen-year-old Timothy Sah, playing in just his second ITF tournament, won both the singles and the doubles titles. The unseeded San Diego resident won all five of his singles matches in straight sets, beating No. 2 seed Sebastian Quiros of Costa Rica 6-2, 6-0 in the final. The doubles title came with more drama, with Sah and 15-year-old partner Russell Benkaim, unseeded, beating unseeded Alex Diaz and Ignacio Garcia of Puerto Rico 3-6, 6-3, 13-11 in the final. Top seed Nandini Das of India won the girls singles, defeating unseeded Nadia Gizdova 6-2, 7-5 in the final. 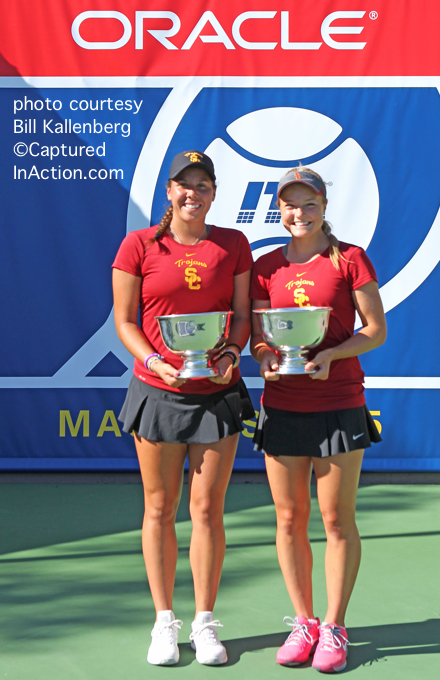 Top seeds Jenna Dean and Jimena Rodriguez-Benito won the doubles title, beating No. 3 seeds Anne-Sophie Courteau and Allisandra Valk of Canada 7-5, 6-2 in the championship match. I finally processed the videos from the finals of the ITF Grade 1 International Hard Court Championships last month in College Park, Maryland. The videos of championships Felix Auger Aliassime and Anna Kalinskaya are below. Finalist Denis Shapovalov's video is here; FinalistTereza Mihalikova's video is here. Dennis Novikov won his second straight $50,000 Challenger title today in Columbus, Ohio, again beating Ryan Harrison in the final, as he had last week in Cary, North Carolina. The 21-year-old beat Harrison in straight sets in Cary, but this week the final went the distance, with Novikov getting two breaks of serve to Harrison's one in a 6-4, 3-6, 6-3 victory. Novikov and Harrison will not meet in the final of the $100,000 Tiburon Challenger this week, as they have been drawn to a possible second round meeting there. With his first two Challenger titles, the former UCLA Bruin is up to a career-high of 144 in the ATP rankings. 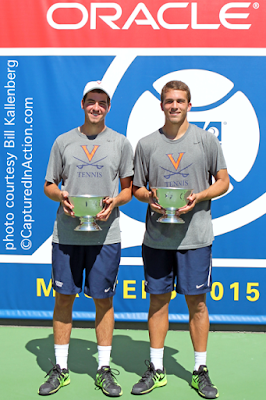 Chase Buchanan and Blaz Rola also repeated as champions this week after winning the doubles title in Cary last week. Playing on their former home courts, the 2012 NCAA champions were unseeded again, but didn't drop a set until the final. Against unseeded Eric Quigley and Mitchell Krueger in the final, Buchanan and Rola won a 36-point tiebreaker to win their fourth Challenger title as a team, taking a 6-4, 4-6, 19-17 decision. Reigning NCAA singles champion Ryan Shane won his first career Futures title today in Costa Mesa, beating Ernesto Escobedo 6-4, 6-3. Shane, a wild card, was playing in his first Futures final, while Escobedo is now 0-5 in singles championship matches at that level. 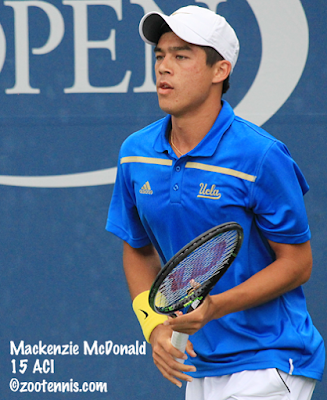 Unseeded Mackenzie McDonald and Martin Redlicki won the doubles title in Costa Mesa, with the UCLA teammates defeating No. 4 seed Jean-Yves Aubone and Benjamin Lock 6-2, 3-6, 10-5. It is McDonald and Redlicki's second Futures title together. The Bruins also won a third title this weekend, with Adrien Puget of France taking the singles title at the $15,000 Futures in Egypt. It is the 24-year-old's third Futures title, all coming this year. At the $15,000 Futures in Canada, Sanam Singh gave the University of Virginia its third title of the day (Treat Huey won the doubles title at the ATP event in St. Petersburg Russia earlier), avenging his loss to Canadian Frank Dancevic in last week's final. The top-seeded Dancevic had won three consecutive Futures titles this month, but Singh, the No. 2 seed, stopped his winning streak at 19 with a 6-4, 6-2 victory. Dancevic had beaten Noah Rubin in the semifinals, while Singh got by Jared Hiltzik. Georgia's Nathan Pasha and USC's Raymond Sarmiento won the doubles title in Canada, their first together, although both have a Futures title with another partner. Pasha and Sarmiento, the No. 2 seeds, defeated top seeds Marko Tepavac of Serbia and Kaichi Uchida of Japan 7-6(4), 6-2 in the final. 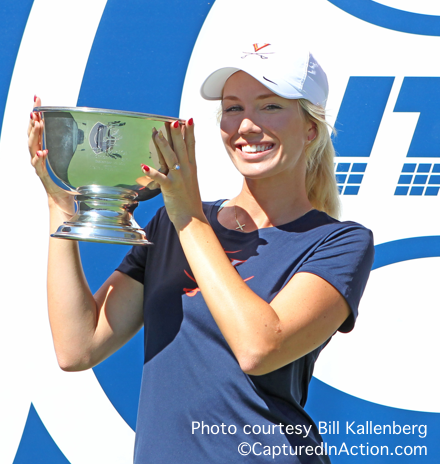 At the $75,000 Women's Pro Circuit event in Albuquerque, qualifier Michaella Krajicek of the Netherlands won the title, beating No. 7 seed Naomi Broady of Great Britain 6-7(2), 7-6(3), 7-5 in the final. Top seeds Paul Goncalves of Brazil and Sanaz Marand won the doubles title, beating Tamira Paszek of Austria and Anna Tatishvili 4-6, 6-2, 10-3, in the final. I've twice covered the Napa Valley tournament, which combines USTA juniors and college players in a round robin format, with the winners of the eight groups playing in a shootout of match tiebreakers to decide the overall winner and a Pro Circuit wild card. This year Cal, which hosts the event at the beautiful Meadowood resort, had three players win their groups: Florian Lakat, Mads Engsted and Billy Griffith. Texas also had three group winners: Liam Caruana, Harrison Scott and Michael Riechmann. Princeton's Alexander Day and Baylor's William Little were the other two group winners. The USTA boys were shut out of the final stage. The semifinals of the shootout were both Texas vs Cal contests, with Cal winning both. Griffith beat Caruana 14-12 and Lakat beat Scott 11-9. With nearly all the fans in attendance cheering for Cal players, the final was quieter than it might have been, with Griffith, a sophomore, coming out on top, defeating Lakat, the recent Mississippi State transfer, 10-6. The last year I covered the tournament, in 2011, Cal also had both finalists. This google document has all the daily results, including today's shootout. The results from each round robin group can be found in this google document. Bobby Knight is following the other men's fall tournaments held this weekend at College Tennis Today. This is an early post today, to catch up on some of the news from Friday. I'll have all the results of the Pro Circuit events Sunday, but prior to today's semifinals, Americans are still in the running in four North American tournaments. At the $15,000 Futures in Canada, Noah Rubin and Jared Hiltzik are in the semifinals. At the $10,000 Futures in California, Deiton Baughman, Ernesto Escobedo and Ryan Shane are in the semifinals and at the $75,000 women's tournament in New Mexico, Julia Boserup has reached the final four. At the $50,000 men's Challenger in Columbus, all four semifinalists are from the US: Tim Smyczek, Ryan Harrison, Alex Kuznetsov and Dennis Novikov. The big international tennis news yesterday was the election of a new ITF president, the first such change of leadership at the ITF since Italy's Francesco Ricci Bitti took over in 1999 and served for 16 years. The immediate past president of the USTA, David Haggerty, was elected to a four-year term in a close vote, edging Anil Khanna of India 200 to 192 on the second ballot. I got to know Haggerty better than most of the USTA presidents in the past 12 years, primarily, I think, because he was at so many junior tournaments. I would often see him watching junior matches at the slams or see him at the Orange Bowl, before he took over as president and even during his tenure. This year, I talked to him at both Wimbledon and the US Open, and he remarked that his ITF candidacy was cutting into his junior match watching time, but he managed to squeeze some in. As you can see from the photo, Haggerty presented the women's American Collegiate Invitational trophy, and while his introduction of that event is not one of the accomplishments that makes it into Chris Clarey's New York Times article on Haggerty's contributions as USTA president, it signifies the importance Haggerty attaches to supporting college tennis. A former No. 1 player at George Washington University, Haggerty spoke to me several times about the necessity of keeping the collegiate path viable and although he will obviously now be focusing on other issues at the ITF, I think his perspective from following the junior and college game will be valuable going forward. In ITF junior news, Maria Mateas won her first title at the Grade 2 level, with the top seed defeating unseeded Jessica Livianu 6-4, 6-3 in Montreal. In the boys final, the top seed lost to an unseeded compatriot, with Canada's Alexis Galarneau beating No. 1 seed Jack Mingjie Lin 7-5, 6-3. During the past two months, there have been several notable college coaching changes, and I'm not sure I've provided links to them in a post. In the most recent, former Boise State All-American Luke Shields has been named head coach of the men's team at Fresno State, taking over for Ryan Stotland, the women's head coach, who was the men's interim coach during the search. Shields had been serving as associate head coach at his alma mater after two years as the women's assistant coach at the University of Washington. Ricardo Rubio, the longtime Texas men's associate head coach, is now head coach at Denver. Former Michigan men's coach Bruce Berque, who was a volunteer assistant at Texas, was named assistant coach, replacing Rubio. Michelle Dasso's contract as head coach of the Illinois women was not renewed for this season after nine years, with Evan Clark serving as the interim coach. Brett Masi took over as men's head coach at Texas Tech, with former Princeton assistant Ryan Keckley returning to San Diego, where he was an assistant to Masi prior to leaving for Princeton in 2012. If you know of others I've missed, please add in the comments section. 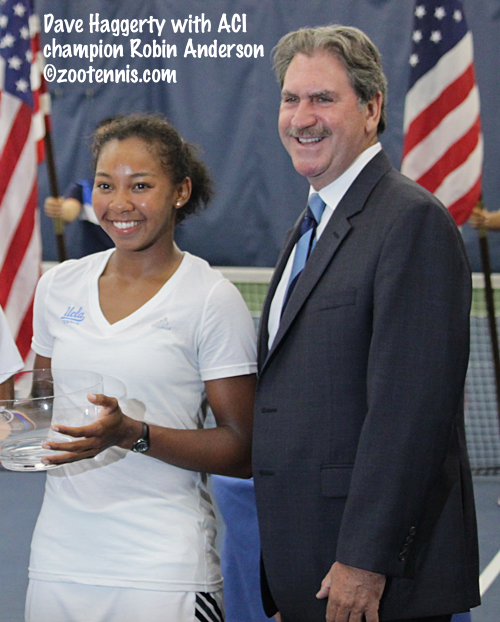 My recap of the second annual American Collegiate Invitational is available now at the Tennis Recruiting Network. On Wednesday, I published photos of the eight women's participants along with quotes and updates on their schedules. Below you'll find the same information for the men, five of whom are still in school and three who have completed their eligibility. Mkrtchian, 22, graduated from UCLA this summer after majoring in both International Development and Political Science, and is not currently considering professional tennis as a career. "I’m taking the LSAT (Law School Admissions Test) next month and I’ve been studying pretty hard for it with the goal of obviously going to a good law school. I also have some post-graduate scholarships that I didn’t want to waste. Never say never, but as of right now, I’m not planning to play. Maybe I’ll play some tournaments before I go to law school, some Futures here and there in California, some Men’s Opens, just enjoy the sport, but my main goal is not pro tennis." The 22-year-old Lin graduated from Columbia this spring with a major in economics. He has been playing professionally this summer, and plans to continue to do so indefinitely. "I’ll keep playing until I reach my potential or stop getting better. It’s like anything, if you do it, just do it 100 percent. It’s been really different since graduating, because it’s been full time tennis, no school. There’s been a lot of adjustments I’ve had to make, I’m still learning a lot: how to handle myself playing every day, having this be my job, taking care of everything myself, because in college, the school does it for you, the coaches do it for you. Managing your own practice, your body, travel, everything that has to do with tennis, so there’s a lot to learn." 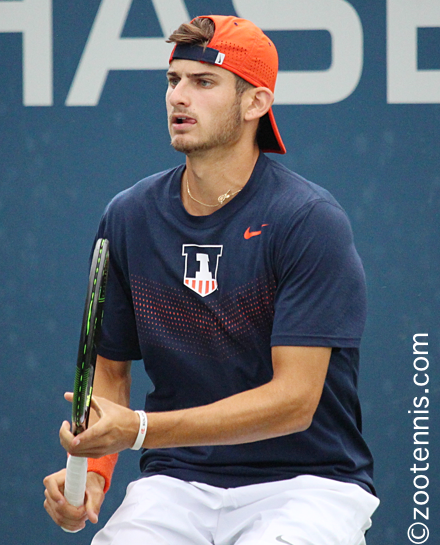 The senior at Illinois is taking the fall off to build his game on the pro circuit, and today he reached the semifinals of a $15,000 Futures in Canada with a three-set win over Lin. Hiltzik said former Illinois star Kevin Anderson has had a major influence on him: "Kevin is an outstanding man. He’s given me a lot of advice. I talk to him as much as I can and he’s definitely an inspiration for me. He’s one of the hardest workers I’ve ever seen. So I’m striving to do that and be like him." Hiltzik said he is not concerned about a reaching a particular ranking while playing this fall. "My goal is just to get better, I don’t have any number in mind. There’s definitely some things I need to improve on going into the [dual match] season and I definitely want those things to be accomplished. We had a team meeting and everybody’s shooting big for this year, so it should be exciting." 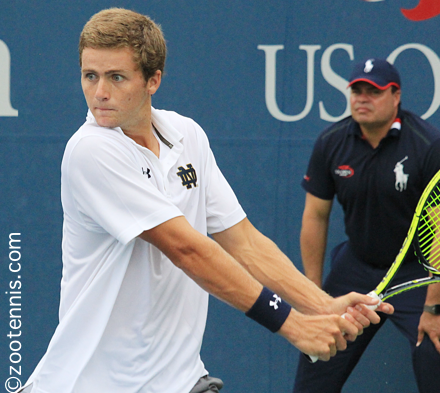 Monaghan, a senior at Notre Dame, is planning to play the All-Americans, Regionals and Indoor Intercollegiates this fall, perhaps adding a pro tournament as well. After graduating in the spring with degree in Management, he plans to play professional circuit. “That’s always been my goal and dream. I just want to keep on getting better this year. I haven’t necessarily fully committed to going pro, but I don’t see what would prevent me, unless I’m seriously injured or something. My junior year in high school, I went to [JTCC] College Park, Maryland, trained there for two years, and that changed my mindset. Then going into school, I went with the approach I’m going to play pro tennis and get the most out of my time at Notre Dame." 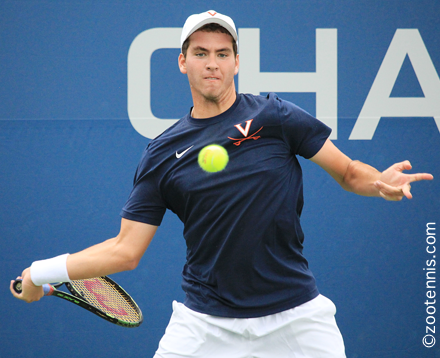 The junior at Virginia, who is planning to play the ITA fall majors, was excited to return to New York for the ACI. 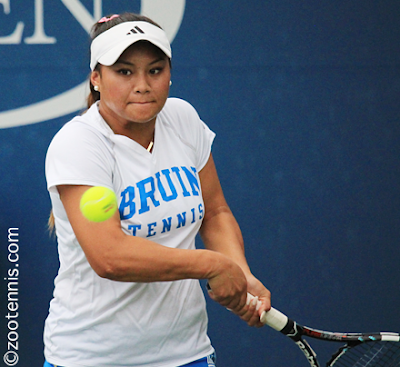 "My goal here is to really showcase college tennis. Just to be at the Open again after playing juniors for many years is really special, I never thought I’d be back playing on these courts. Second of all, we’re here to help college tennis and make it more popular and I think we’re doing that. It’s really special that the USTA is doing this college event for us here." Shane, who today reached the semifinals of the $10,000 Futures in California, didn't waiver on his decision to return to school for his senior year after winning the NCAA singles title back in May. "[Brian] Boland runs an amazing program there so going back another year, I feel I’ve just been getting better each year. I’ve been on an upward trajectory and one more year is not really hurting me too much. I’m playing professional events in the fall, so I can play those tournaments and still go to school. And one more fight with my team and hopefully a wild card to the US Open is still on the line, so I think it’s worth it to go back. DT(assistant coach Dustin Taylor) and Boland have been working to get me ready for the pros, so I think another year with them will really help me." Austin, 22, graduated from Vanderbilt last spring with a double major in economics and political science, but after during his time in Nashville, he decided he wanted to make a career out of tennis. "I don’t think of it as something to fall back on, because I’m very certain tennis is my career, in what ever facet that may be. My sophomore year I wasn’t that serious about pro tennis. I had taken an internship in Washington DC that summer and I didn’t play a lot of tennis. I came back and I realized it wasn’t really time for me to sit in an office yet—not that there’s anything wrong with that for some people. But tennis is something I’m really passionate about, I’ve been doing it all my life, so why not keep going and play? I’m never going to be 22 years old again so now’s the best time to do it." 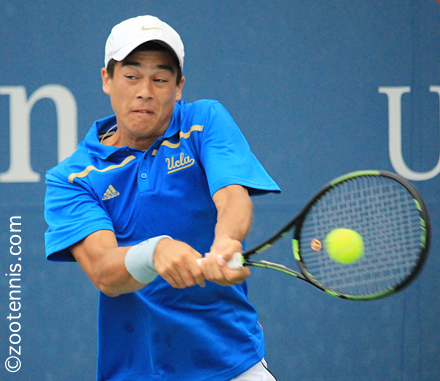 The junior at UCLA is currently playing Futures in California, where he reached the final last week, and will then compete in the Northern California Challengers. He is not entered in the All-American Championships and would need a wild card to play the Indoor Intercollegiates. "This summer I took a little bit of a mental break, it’s a long season in college and I’d been going for a while. I am in school, but I’m trying to play a lot of the pro events, as many as possible and stay in school, work with the team and Billy [Martin] and Grant [Chen]. I’m going day by day now, just wanting to play good tennis, doing the right things and just keep getting better." The singles finals are set for the ITF Grade 2 in Montreal, Canada with a US champion a certainty in the girls draw. 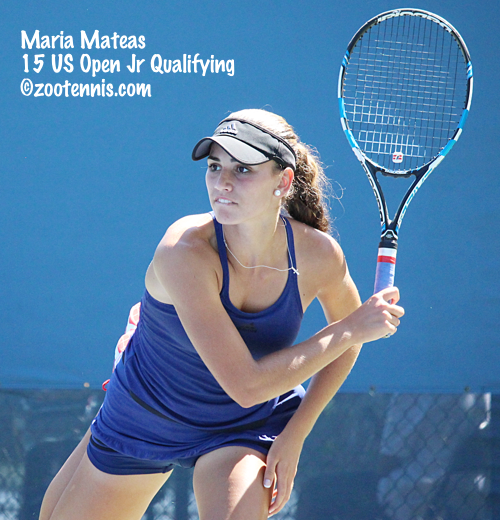 All eight girls quarterfinalists were American, and in today's semifinals, top seed Maria Mateas defeated No. 3 seed Abby Altick 6-3, 6-3 and unseeded Jessica Livianu, who had beaten No. 2 seed Kariann Pierre-Louis in the quarterfinals, downed No. 4 seed Morgan Coppoc 2-6, 6-0, 6-3. It is the 17-year-old Livianu's first ITF final; Mateas won a Grade 3 title in Bolivia last fall. The boys final will feature two 16-year-old Canadians, after all three remaining Americans fell in the quarterfinals. Top seed Jack Mingjie Lin will play unseeded Alexis Galarneau for the title. Galarneau defeated Lin in their previous ITF junior meeting last year at a Grade 4 in Costa Rica. The girls doubles final was also an all-American contest, with unseeded Safiya Carrington and Pierre-Louis defeating No. 4 seeds Carson Branstine and Taylor Johnson 6-3, 6-2. The boys doubles champions are No. 2 seeds Lin and Joshua Peck, also of Canada, who beat Alafia Ayeni and Caleb Chakravarthi 5-7, 6-3, 10-5 in the final. 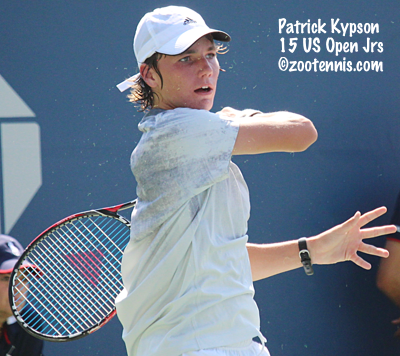 Patrick Kypson, who lost in the quarterfinals this week in Canada, has been named to the USA's Junior Davis Cup team to replace Gianni Ross. Ross is unable to travel to Madrid due to an illness. The Porsche Napa tournament, which combines college players and a USTA team of juniors in a round robin event, is this weekend, and the tradition of the juniors playing Cal prior to the tournament continued. This year Cal won all six singles matches and three of the four doubles matches played. Complete results are available at the Cal website. At the $50,000 Columbus Challenger, seven of the eight quarterfinalists are American: Tim Smyczek(1), Sekou Bangoura, Ryan Harrison(4), Alex Kuznetsov, Bjorn Fratangelo(3), Dennis Novikov(8) and Chase Buchanan. Unseeded Henri Laaksonen of Switzerland plays Harrison Friday in the only mixed country match. The United States is not as well represented in the $75,000 women's event in Albuquerque, with three quarterfinalists: Vania King, Anna Tatishvili(2) and wild card Julia Boserup advancing. King defeated No. 6 seed Alexa Glatch 0-6, 6-4, 7-5, Tatishvili beat Sanaz Marand 6-0, 6-3 and Boserup downing No. 8 seed Maria Sanchez 6-3, 6-3. Julia Jones fell to Naomi Broady of Great Britain 6-1, 7-6(7), while Robin Anderson lost to top seed An-Sophie Mestach of Belgium 6-4, 6-4. All three US women are in the bottom half, with Boserup and Tatishvili playing in the quarterfinals. At the $15,000 Futures in Canada, three US men are through to the quarterfinals: Noah Rubin, Jared Hitzik and Winston Lin. No. 6 seed Rubin defeated Sami Reinwein of Germany 7-6(4), 6-2; No. 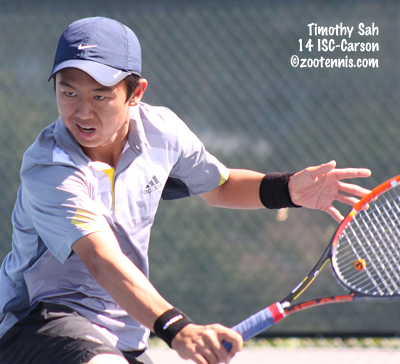 7 seed Hiltzik beat Raymond Sarmiento 6-2, 6-4 and the unseeded Lin downed Nicolas Podesta 4-6, 6-3, 6-4. Lin and Hiltzik will play in the quarterfinals. Top seed Frank Dancevic is going for his fourth straight Futures title this month in his home country. 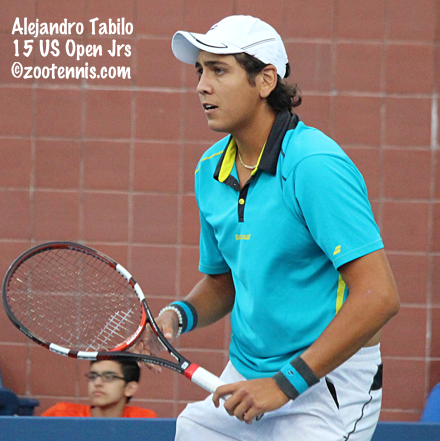 Eighteen-year-old Alejandro Tabilo of Canada, a regular on the ITF Junior Circuit, received a wild card and has used it to earn his first quarterfinal appearance in a Futures tournament. Tabilo defeated lucky loser Alexander Centenari 7-6(5), 6-4 in today's second round. The match between top seed Marcos Giron and Ernesto Escobedo is not yet complete today at the $10,000 Costa Mesa Futures, but six Americans are already through to the quarterfinals: Deiton Baughman(2), Wil Spencer(6), Jean-Yves Aubone(7), Junior Ore, Collin Altamirano and Ryan Shane. 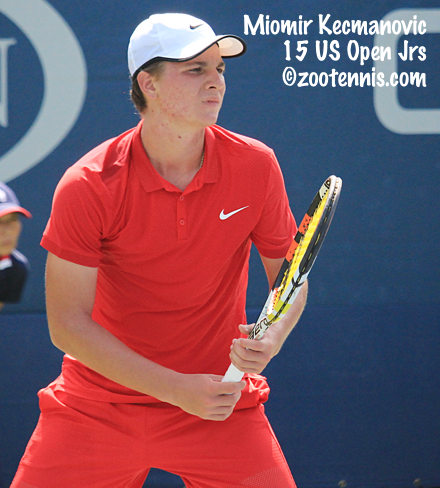 Wild card Shane defeated Mackenzie McDonald, last week's finalist at the Claremont Futures, 6-4, 7-5. My recap of the American Collegiate Invitational will be out Friday at the Tennis Recruiting Network, and I will provide photos and quotes from the eight men who participated in the event two weeks ago in New York then. In today's post, I'll update the plans and provide quotes from the eight women who competed in the second annual ACI. Four have completed their eligibility and four are still in school. 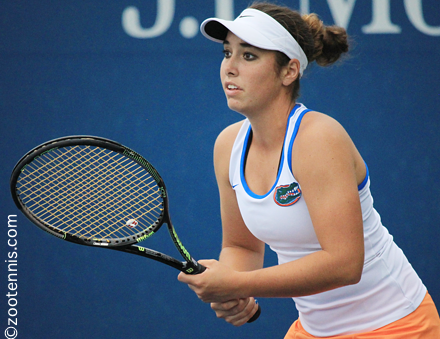 Kuhlman, a sophomore at Florida, said she will be playing next month's All-American Championships in California, and hopes to mix in some pro events this fall to keep her WTA ranking up. Quote on Florida's prospects for the 2015-16 season: "We have most of the team returning, so we’re really excited to keep working toward our goal of a national championship." Julia Elbaba, a senior at Virginia, said she is planning on playing the fall majors, and after graduation, will play the professional circuit full time. On playing in New York, near her home, defending USTA/ITA Indoor Intercollegiate champion Elbaba said: "I love playing here, at any opportunity, indoor or outdoor." 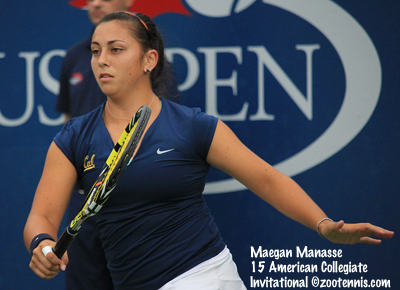 Manasse, a junior at Cal, has all the collegiate majors on her schedule this fall. She did not play the US Open in the juniors, so was excited to get the opportunity to compete in the ACI. "When I came here Tuesday night and saw the lights on Arthur Ashe, I thought, whoa, I’m finally here. Having credentials, getting in everywhere, it’s crazy. It’s been a great experience." Austin, a sophomore at Florida, is planning on playing the All-American Championships and returning to New York for the Indoor Intercollegiate Championships. Although she had played the US Open four times as a junior and twice in the women's qualifying, she is still impressed by the scene at the National Tennis Center. "I’ve been here a lot of times, but it’s always really exciting and a cool experience. Every year I’m always like, oh my god." Jones, who graduated from Ole Miss this summer, said she is planning to play all fall, probably exclusively in the United States. A wild card, she won her first round at this week's $75,000 Albuquerque tournament today, beating Alexandra Stevenson 6-2, 6-3. Jones had never been to the Open prior to the ACI. "This is my first time at the Open and it’s pretty cool to be playing there your first time, not watching. I was so happy. It was just the icing on the cake to a really good senior year." Herring, who graduated from Georgia this spring, is planning to return to the Pro Circuit the first of October. To help with the financial challenges of starting out on the pro tour, Herring has turned to GoFundMe.com. "It was amazing to see the support I got from the people from my hometown that I hadn’t spoken to in years, the encouragement they gave me. It was a little weird at first, I didn’t know if I wanted to do it, but I had to get over it to look for help. And it has helped, paid for some of my tournaments." Van Nguyen started at UCLA in January of 2012, so she has not yet completed her degree, which she wants to do before going out on the pro tour. "I have another year of school left, and I can’t compete, but I’m training with the team, fitness and stuff, and I’ll be helping out. And then when I graduate, I’ll be able to play tournaments full time. It’s tough during school, but that’s the plan." Anderson, who graduated from UCLA this summer with a degree in Anthropology, qualified and won her first round today at the $75,000 Albuquerque tournament. Her results during the Pro Circuit this summer were encouraging, but didn't lead her to any specific goals. "I don’t really have any expectations. Right now I’m just trying to work every day to see how good I can be." Anderson also admitted leaving the team atmosphere isn't easy. "Not having all your teammates and your coaches there along side you is a little bit difficult. It's kind of like the juniors now, or when I played Pro Circuit before I went to school. It's all on you now, so I'm learning to get back to that." The team nominations for the Junior Davis Cup and Junior Fed Cup competitions, which begin next Tuesday in Madrid, were published earlier this month, with the United States the defending champions in both events. Michael Mmoh, William Blumberg and Gianni Ross won the Junior Davis Cup title in Mexico last year, defeating Korea 3-0, while the US team of CiCi Bellis, Tornado Alicia Black and Sonya Kenin took the Junior Fed Cup title. The ITF has sponsored this global team competition for players 16-and-under since 1985. Ross will be the veteran on this year's team, which is coached by Sylvain Guichard, and Ross is joined by Sam Riffice and Vasil Kirkov. All three competed in the North and Central American Qualifying this spring in Boca Raton, beating Canada 3-0, but that team was without Felix Auger Aliassime, who was out with an injury. Auger Aliassime, who at No. 23 is by far the ITF's highest-ranked player in the competition, and Denis Shapovalov, who did play in Boca Raton, losing to Riffice, won the US Open boys doubles title, so they are considered the country to beat, although the seeds have not yet been announced. Although their ITF rankings are not as impressive as the Canadians', Germany has two outstanding 15-year-olds in Rudolf Molleker and Nicola Kuhn, who led their country to last year's ITF World Junior Tennis 14-and-under, beating the Canadian team, led by Auger Aliassime, 2-1 in the final. The USA's Junior Fed Cup team will consist of Claire Liu(32), Michaela Gordon(24) and Kayla Day(51). CiCi Bellis, who played the qualifying in Boca Raton, is not on the team, with Liu not participating in qualifying due to an injury. Another player who could have a major impact on the competition is Bianca Andreescu of Canada, who did not play in Boca Raton due to injury, but is up to 23 in the ITF junior rankings, behind No. 7 Charlotte Robillard-Millette, but now ahead of Katherine Sebov, ranked 26. Russia will also be a top contender, with Olesya Pervushina(21), Evgeniya Levashova(27) and Elena Rybakina(37) hoping to add the Junior Fed Cup to the World Junior Tennis championship they won in August. The Czech Republic, with Marketa Vondrousova and Monika Kilnarova, and Australia, with Destanee Aiava, Jamiee Fourlis and Seone Mendez, are also contenders for the girls title. The girls nominations are here; the boys nominations are here. Although Mike Woody may not be a name familiar to all of you, he is well known throughout Michigan and the Midwest as the Director of Tennis at the Midland Community Tennis Center, while also serving as the tournament director of the $100,000 Dow Corning Tennis Classic in Midland every February. After 20 years, Woody is leaving Midland to become the Genesis Health Club's director of tennis in Wichita, Kansas, a move that instantly deprived the state's tennis community of one of its most energetic and influential members. 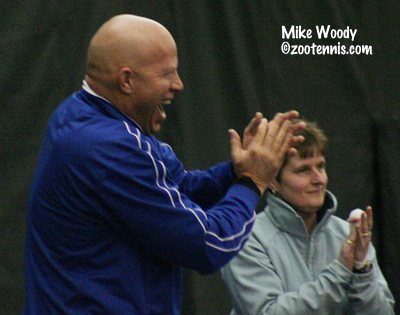 Back in 2011, I wrote this article for the Tennis Recruiting Network (subscription required for full access) about the community outreach Woody did during the tournament, and when I covered the event again this year, the connection was as strong as ever. I hope the passion Woody has for the game can ignite a similar enthusiasm in Wichita, and that Midland will continue to benefit from his work there. But he will be missed, I'm sure of that. Here is an article about Woody's arrival from the Wichita Eagle. Last week was a slow one on the ITF Junior Circuit, with all tournaments the lowest levels of Grade 4 or Grade 5. But two young American girls took the opportunity to continue to build their rankings, with 14-year-old Sabina Dadaciu winning her second straight Grade 5 singles title in Honduras and 15-year-old Malkia Menguene claiming her third straight title in Africa. Dadaciu has not lost a set in winning the singles and doubles titles two weeks ago and the singles title last week (she didn't compete in the doubles draw). For the second week in a row, Dadaciu, the No. 5 seed, beat top seed Rut Galindo of Guatemala in the final, this time by the score of 6-4, 6-3. 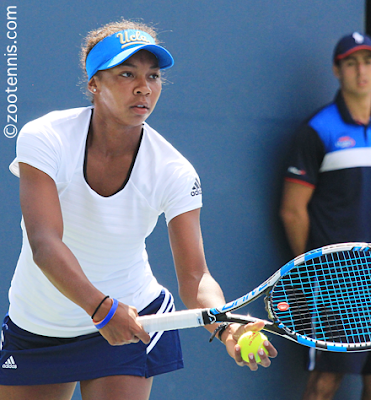 She is now up to 368 in the ITF junior rankings, after getting her first points back in April. Sixteen-year-old Fletcher Scott, the No. 7 seed, reached the final in Honduras, lost 6-3, 6-2 to top seed Juan Martin Ramirez Mejia of Colombia. Zachary Garner partnered Ryan Mueller of Guatemala to take the boys doubles title, with the No. 2 seeds defeating unseeded Thomas Guy of New Zealand and Xavier Oshinowo 4-6, 6-1, 10-6. Menguene won two Grade 4s, one in Benin and one in Togo earlier this month. At last week's Grade 5 in Togo, the top-seeded Menguene defeated unseeded Chloe Cirotte of France 6-3, 6-3 in the final. Menguene was in the 2000s in the ITF rankings at the end of June; she is now at 265. Two Grade 2s are on the schedule this week, with most of the Americans playing in Montreal. Jack Mingjie Lin of Canada is the top seed there, with Mwendwa Mbithi seeded second and Patrick Kypson seeded third. There are 17 US boys and 18 US girls in the 32-player draws, with the top three girls seeds from the US: Maria Mateas, Kariann Pierre-Louis and Abby Altick. The other Grade 2 is in Uruguay, with six US girls and one US boy in the draws. The USTA Pro Circuit hosts this week's largest prize money tournament on the ITF Women's Circuit, the $75,000 event in Albuquerque. An-Sophie Mestach of Belgium is the top seed, with Anna Tatishvili seeded No. 2. Robin Anderson, Sabrina Santamaria, Jacqueline Cako and Nadja Gilchrist are among the former college players in to the final round of qualifying. Main draw wild cards were given to Julia Jones, Julia Boserup, Jan Abaza and Vicky Duval. The second biggest event in terms of ITF Women's Circuit prize money is also in North America this week, the $50,000 tournament in Monterrey, Mexico. Grace Min is in the main draw, and Kristie Ahn has qualified. Southern Cal's Giuliana Olmos, who won the Oracle Masters doubles title yesterday, received a wild card into the main draw. 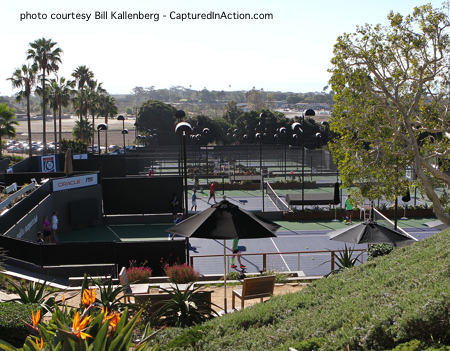 The men's USTA Pro Circuit event this week is another $10,000 Futures tournament in California, this one in Costa Mesa. As was the case last week in Claremont, Marcos Giron and Deiton Baughman are the top two seeds. Baughman is a wild card entry, as is Virginia's Ryan Shane. The other two wild cards were won in competitions, with Australia's Ryan Agar and 16-year-old Miomir Kecmanovic of Serbia earning those. The $50,000 Columbus Challenger, which is not a part of the USTA Pro Circuit, features a nearly identical field as the one in Cary last week, with the exception of the top seed, Tim Smyczek, who did not play Cary. I can't recall ever seeing a draw without a wild card, but there are none in Columbus. Current Buckeye Hugo Di Feo and former Buckeye Peter Kobelt qualified; Blaz Rola, Connor Smith and Chase Buchanan are former Ohio State players who received entry on their own rankings. Dennis Novikov, the Cary champion, will play Stefan Kozlov in the first round. In addition to Novikov, another college veteran, Tom Jomby of Kentucky, won a title last week--two actually--at the $10,000 Futures in Turkey, where he claimed the singles and doubles championships. 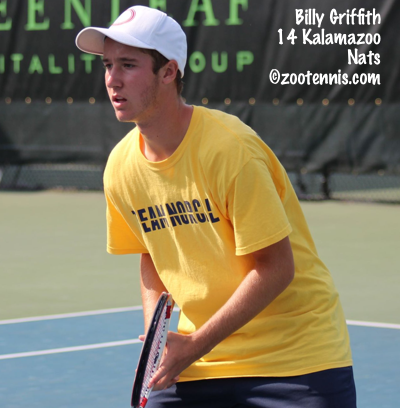 Bobby Knight at College Tennis Today has more on the college men's performances last week. The Tennis Recruiting Network has published its top prospects list, which is updated only twice a year, in the fall and in the spring. The blue chip designation is the highest accolade, but adding a star or two is also a notable achievement. Complete lists are available here. 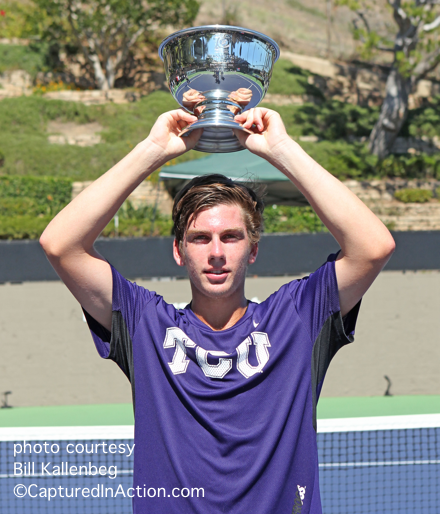 TCU sophomore Cameron Norrie and Virginia senior Danielle Collins were crowned champions of the first Oracle ITA Masters event today at the Malibu Racquet Club, with Norrie defeating Nicolas Alvarez of Duke 6-3, 7-6(2) and Collins collecting her title without playing a point. Hayley Carter of North Carolina was to be Collins' opponent in the final, but the North Carolina junior injured her wrist in a match on Saturday and was unable to compete in the final. This had to be doubly disappointing, as the match was scheduled to be featured live on the Tennis Channel after the men's final. Instead, the women's doubles final was broadcast instead. After a slow start, the men's final did provide some good tennis for those tuning in for one of the first live television broadcast of college tennis in many years. Norrie led 5-0 in the first set, benefitting from Alvarez errors, particularly in games three, four and five, with Norrie winning all three games on deciding points in the no-ad format. Norrie, who is from New Zealand but represented Great Britain during most of his ITF Junior career, was unable to serve out the set at 5-1, but he did finish it on his second opportunity. The second set stayed on serve throughout the first six games, with Alvarez making fewer errors than he had in the opening set. But at 3-3, 30-all, his mediocre approach shot resulted in a perfectly executed cross court forehand pass from Norrie, and he converted the break point when Alvarez sent a forehand wide. Alvarez saved a match point with a big first serve on a deciding point at 3-5 and Norrie couldn't serve out the match in the next game. At 30-all, Norrie turned his ankle and fell, with Alvarez putting the ball away into the vacated court, followed by a shanked forehand which brought Alvarez even. Norrie recovered to hold for 6-all, serving an ace on game point, and he was, as Tennis Channel's Justin Gimelstob described him, nearly flawless in the tiebreaker. He moved well, came forward, served big and forced errors with his ground strokes. The broadcasters made much of Norrie's previous loss to Alvarez at the Men's Team Indoor, where he held four match points, but if that was in Norrie's head, it didn't show in the tiebreaker. The men's doubles title went to the second-seeded Virginia team of Luca Corinteli and Ryan Shane, who beat unseeded Guilherme Hadlich and Gabriel Sidney of Pepperdine 7-5, 6-4 in the final. Shane won the men's consolation singles, beating Axel Alvarez of Oklahoma 6-4, 6-3. The unseeded team of Giuliana Olmos and Gabby Smth of Southern Cal won the women's doubles title, defeating the unseeded Kentucky team of Mami Adachi and Aldila Sutjiadi 6-2, 6-2. 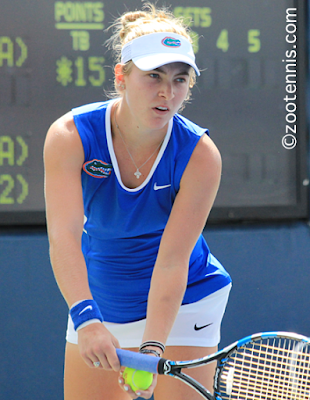 The women's consolation singles final saw Cal's Klara Fabikova defeat Miami's Stephanie Wagner 6-2, 6-3. Complete results can be found at the ITA tournament page. 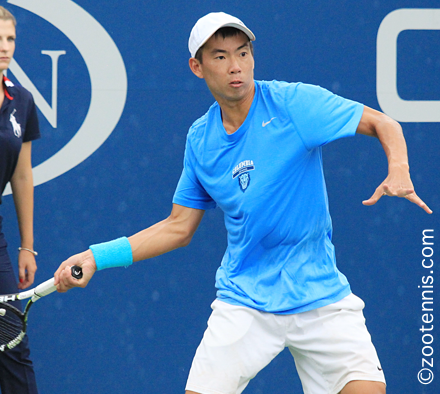 Former collegians took the titles today at the $50,000 Cary Challenger, with UCLA's Dennis Novikov winning his first singles title at that level with a 6-4, 7-5 victory over Ryan Harrison. 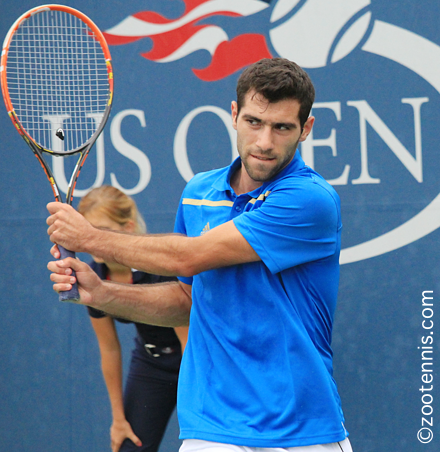 Novikov will reach a career-high in the 160s when Monday's ATP rankings are released. The doubles title went to Ohio State's 2012 NCAA doubles champions Chase Buchanan and Blaz Rola, who defeated top seeds Austin Krajicek and Nick Monroe 6-4, 6-7(5), 10-4. It was the second Challenger win of the year for Buchanan and Rola. At the $10,000 Claremont Futures, No. 2 seed Deiton Baughman defeated unseeded UCLA junior Mackenzie McDonald 2-6, 6-3, 6-3 to claim his third Futures title of the year. 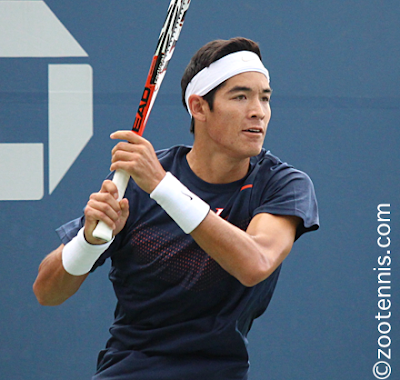 When the points are added in another week, the 19-year-old from Carson, California will be in the ATP Top 400 for the first time in his career. With the US in Tashkent, Uzbekistan for Davis Cup, the matches were all played in the middle of the night here in the Eastern time zone, but the result was positive, with the US defeating the hosts 3-1 to remain in the World Group. Jack Sock, playing No. 1, defeated Denis Istomin 6-2, 2-6, 6-4, 6-4 to clinch the win for the United States. See the Davis Cup website for more on the US win. The draw for 2016 will be held on Wednesday and the US will find out then who and where they'll play in next winter's first round. Great Britain defeated Australia and Belgium got by Argentina and will be the unlikely participants in 2015 Davis Cup final in November. After a very long day at the Malibu Racquet Club, the finals are set for the inaugural Oracle ITA Masters. All four men's seeds lost in the first round on Friday, and when the quarterfinals and semifinals were completed on Saturday, TCU sophomore Cameron Norrie and Duke sophomore Nicolas Alvarez had advanced to the final. Norrie defeated Tulsa's Or Ram-Harel 6-4, 6-1 and Alvarez downed Guillermo Nunez of TCU 6-3, 6-2 in the quarterfinals. The semifinals were not as straightforward. Alvarez needed to win a second set tiebreaker to get into a third set with Texas Tech's Felipe Soares, but he survived for a 3-6, 7-6(7), 6-0 decision. Norrie also dropped the first set in his semifinal, but came back to defeat Dominik Koepfer of Tulane 1-6, 6-4, 6-4. The women's final will be an all-ACC affair with North Carolina's Hayley Carter playing Virginia's Danielle Collins. Carter's two wins on Saturday came against Giuliana Olmos of USC, by a score of 6-4, 6-3 and Clemson's Joana Eidukonyte, whom she defeated 6-2, 6-4 in the semifinals. No. 4 seed Collins, who lost only two games in her first two victories, had a much tougher task against top seed Maegan Manasse of Cal, but the Virginia senior came through with a 6-3, 6-7(3), 6-4 win in a match that ended after 8:30 p.m. Pacific time. Manasse is still scheduled to play her doubles semifinal match tonight. The complete results, including doubles and consolation matches, can be found at the tournament page at the ITA website. The finals are scheduled to be aired on the Tennis Channel Sunday beginning at 12:30 p.m Pacific. At the $10,000 Claremont Futures, UCLA junior Mackenzie McDonald will play 19-year-old Deiton Baughman in Sunday's final. It is McDonald's first Futures final, while Baughman has won two Futures titles, both this year. Neither has lost a set in their first four wins, with Baughman beating former Pepperdine All-American Sebastian Fanselow of Germany 6-3, 6-3 and McDonald defeating Virginia sophomore Collin Altamirano 6-2, 6-2 in today's semifinals. 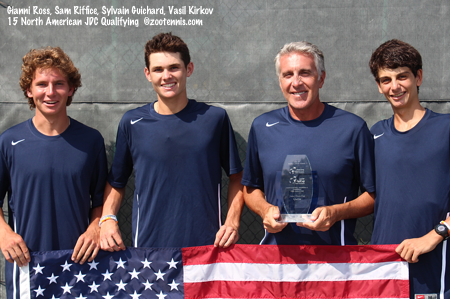 The doubles final, played Friday, was won by Jean-Yves Aubone(Florida State) and Gonzales Austin(Vanderbilt). The No. 2 seeds beat top seeds Junior Ore(Texas A&M) and Hunter Nicholas (San Diego State) 7-5, 3-6, 10-6. Tournament press aide Steve Pratt filed this report, which includes quotes from Baughman about his win. 2012 Kalamazoo champion and former UCLA Bruin Dennis Novikov has reached his first ATP Challenger final in Cary, North Carolina. The No. 7 seed defeated No. 6 seed Brydan Klein of Great Britain 1-6, 7-5, 7-5 in today's semifinal and will face No. 5 seed Ryan Harrison, who defeated No. 4 seed Blaz Rola of Slovenia 4-6, 7-5, 6-2. Unlike Claremont and Cary, the final at the women's $25,000 Pro Circuit event in Redding, California will not feature Americans. Vania King, who had beaten top seed defending champion Jennifer Brady in the first round, lost in today's semifinal to Heidi El Tabakh of Canada 7-6(3), 2-6, 6-1. The eighth-seeded El Tabakh will play No. 5 seed Sherazad Reix of France, a 6-4, 6-4 winner over No. 7 seed Paula Goncalves of Brazil. The doubles title went to top seeds Caitlin Whoriskey and Ashley Weinhold, who defeated No. 2 seeds Michelle Sammons of South Africa and Varatchaya Wongteanchai of Thailand 6-2, 7-5. Jonathan Kelley is in Redding, and you can read his account of the past few days of action at his blog On The Rise. The draws have been released, with some last minute substitutions, for the Oracle Masters event, the new collegiate major being held for the first time this weekend at the Malibu Racquet Club. The three-day event has small fields, with 16-player singles draws and eight-team doubles draws. Cal's Maegan Manasse, fourth in the preseason rankings, is the top seed in the women's draw, with Stanford's Carol Zhao(1) and Florida's Brooke Austin(2) not entered and Virginia's Julia Elbaba(3) a late withdrawal. Elbaba was replaced by Mississippi State's Jasmine Lee. Miami's Stephanie Wagner is the No. 2 seed, Vanderbilt's Sydney Campbell is No. 3 and Virginia's Danielle Collins is No. 4. 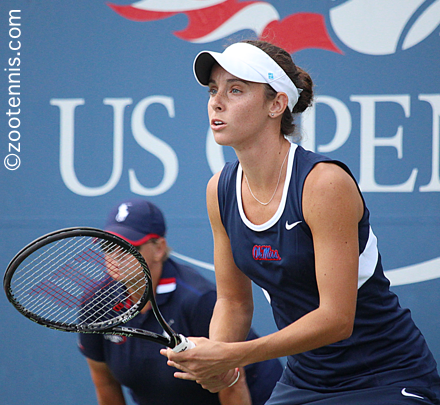 With all 16 women in the ITA Top 25, upsets will be more technical than actual. Oklahoma's Axel Alvarez is the top seed in the men's draw, with Virginia's Ryan Shane No. 2, Baylor's Julian Lenz No. 3 and Notre Dame's Quentin Monaghan No. 4. UCLA's Mackenzie McDonald, ranked fourth nationally, did not enter, and is playing the Claremont Futures this week, where he has reached the quarterfinals. Illinois' Jared Hiltzik, initially listed as a participant, told me in New York that he is taking the fall off, and he was replaced by Tom Fawcett of Stanford. But Fawcett qualified for the Claremont Futures and today reached the quarterfinals with a 3-6, 6-3, 6-4 win over No. 3 seed Jean-Yves Aubone, so Florida State's Benjamin Lock was named to the field. Fawcett will play McDonald on Friday in Claremont. 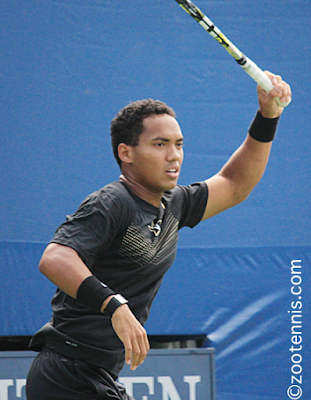 Oklahoma's Andrew Harris is also out of the Oracle Masters, with Tulsa's Or Ram-Harel taking his place in the draw. As with the women, all 16 men are ranked in the ITA preseason Top 25. Manasse and Denise Starr are the top seeds in women's doubles, with Austin Smith and Ben Wagland No. 1 in the men's doubles draw. The Oracle Masters digital tournament program is advertising live coverage of the finals on Tennis Channel Sunday, although my Tennis Channel TV schedule shows Davis Cup in that time slot. Live scoring is available at the ITA tournament page, as well as full draws. Sports Illustrated's Jon Wertheim spoke with Oracle co-CEO Mark Hurd, a former Baylor player, about the company's support of the tournament and college tennis, the recent format changes and how tennis and business skills intersect in this podcast. Davis Cup begins for the United States team of Jack Sock, Sam Querrey, Steve Johnson and Donald Young at 1 a.m. Eastern time Friday morning in Uzbekistan, with Johnson taking on Denis Istomin, followed by Sock playing Farrukh Dustov. The US, playing without Isner and the Bryans, must win the tie to stay in the World Group for 2016. Below is the complete list of Davis Cup ties this weekend. Many former college players are on their countries' rosters, with a current one having the most challenging assignment. Due to Spain falling out of the World Group, they take on Denmark in Zonal competition, with Ohio State sophomore Mikael Torpegaard facing none other than Rafael Nadal in the opening rubber. 2014 ITF World Junior Champion Andrey Rublev, who helped Russia relegate Spain in July, also has a tough assignment, taking on Italy's Fabio Fognini at No. 2 singles.